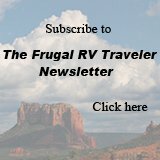 RVing in New Mexico offers unrivaled, unique scenery and very affordable camping options. One of New Mexico's best-kept secrets is their State Parks' Annual Camping Pass. It includes your camping fees! Non-residents pay $225.00 and the pass gives you day-entry plus a campsite in all New Mexico state parks for the whole year! For New Mexico residents, the annual fee is $180.00 or, for seniors (62 or older and residents), $100.00. There's a limit of how long you can stay in each park: 14 consecutive days in any 20-day period. But with 35 state parks (29 with campgrounds), you can plan your route to enjoy each one at your leisure. In season, you'll definitely want to set up reservations if that's your plan. If you're only passing through, day entry, campsites, and even electric and water hook-ups are quite affordable even without the annual pass. Boondocking is, of course, another option. We found plenty of that in New Mexico - some of it with amazing scenery and within easy reach of the state's best natural and historic wonders. New Mexico: magnificent mountain views, raging rivers, North America's most spectacular cave park, historic ruins, first-class skiing, natural hot springs, a vibrant cultural scene, and quaint mountain villages. Even the cities have a unique flavor!